Background: Several multi-institutional prospective randomized trials have demonstrated not only short-term benefits but also long-term oncological safety using laparoscopy for colon cancer. However, in all prior trials, the transverse colon was excluded. Therefore, it has not been determined whether laparoscopy can be used in the setting of transverse colon cancer. Moreover transverse colectomy for transverse colon cancer is controversial. 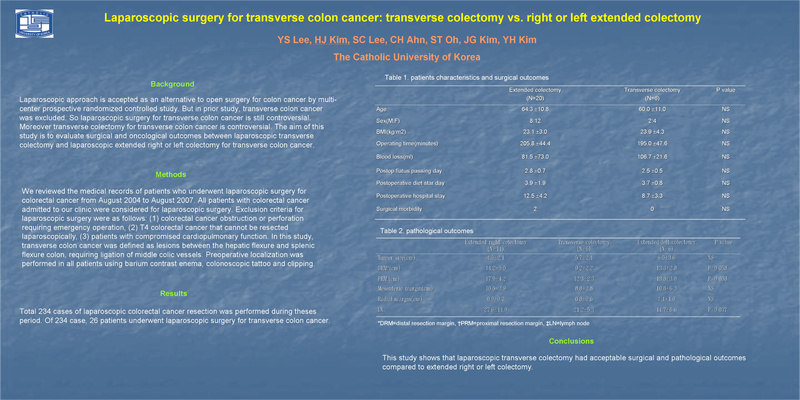 This study evaluated the peri-operative outcomes and short-term oncological outcomes of laparoscopic transverse colectomy and extended right and left colectomy for transverse colon cancer. Methods: Retrospective review of patients with colorectal cancer treated using laparoscopy from August 2004 to August 2007. CT, barium enema, and colonoscopy were performed to localize the tumor preoperatively. Peri-operative outcomes and short-term oncological outcomes were compared between Extended right & left colectomy, and transverse colectomy. Results: Of 234 patients, 26 patients underwent laparoscopic surgery for transverse colon cancer. Extended right & left colectomy was performed in 20 cases, and transverse colectomy was 6 cases. Patients with transverse colectomy were similar to patients with extended right & left colectomy in age, gender, BMI, blood loss, time to pass flatus, start of diet, hospital stay, tumor size, number of lymph nodes, and radial margin. Distal and proximal resection margin of extended Rt&Lt colectomy was longer than that of transverse(9.2¡¾2.2 cm vs. 14.0¡¾4.4cm, p=0.002, 12.3¡¾2.3cm vs. 16.7¡¾4.2cm, p=0.005). One case in transverse colectomy was converted to open surgery because T4 lesion of transverse colon cancer. There were no differences between two groups in terms of morbidity and mortality. Conclusions: The results of this study shows laparoscopic transverse colectomy had acceptable peri-operative outcomes and short-term oncological outcomes compared to extended right and left colectomy. However further investigations are needed to establish the long-term oncological safety of laparoscopic surgery for transverse colon cancer including laparoscopic transverse colectomy.